Teaching Staff. 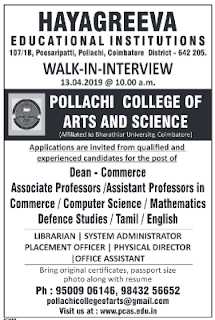 Refer the official website www.pcas.edu.in for Pollachi College of Arts and Science Jobs. 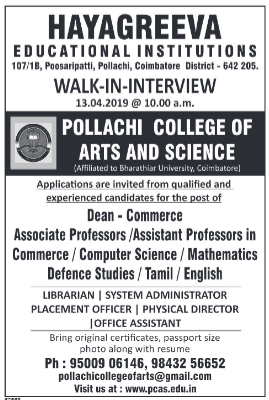 Interested and Eligible candidates can attend with Updated Resume ,Original Educational certificates and Recent Pass port Photo graph walk-in interview on 13-04-2019 to College address given below. Interview slot is at 10Am on 13-04-2019. Eligibility criteria, Salary, selection procedure, how to apply and important dates, are given below. Pollachi College of Arts and Science. Walk-in Interview date on 13-04-2019. Eligible Applicants can attend with Updated Resume ,Original Educational certificates and Recent Pass port Photo graph walk-in interview on 13-04-2019 to College address given below.